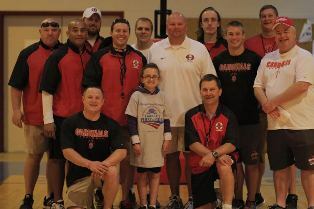 WESTERVILLE, OHIO – Nearly 400 student-athletes participated in the fifth-annual Ohio Lauren's First and Goal Football Camp on Sunday, June 22 at Otterbein University. The event, welcoming high school players representing 11 different states, raised $12,720 for pediatric brain tumor research. "I think the camp just keeps getting better and better," Otterbein head coach Tim Doup said. "We are still hoping to spread the word a little more and grow this event, but it's such a great day on the calendar to help support a great cause." Lauren's First and Goal has raised a total amount of $127,251 so far this year. The 12th-annual camp was recently held at Lafayette College in Easton, Pa., attracting 1,912 participants. LFG was created in 2004 by John and Marianne Loose in honor of their now 17-year-old daughter Lauren, a pediatric brain tumor survivor. "So many parents and kids have told me that it's the best camp they attended this summer," John Loose said. "The Otterbein community is so welcoming and supportive every time we come out here, and so many coaches volunteer their time when they could be off relaxing. It's been a great day yet again." During the one-day camp, players receive instruction in a variety of offensive and defensive skills from college coaches near and far. More than 100 coaches representing 35 colleges and universities from Ohio and neighboring states volunteered at the event. Purdue University head coach Darrell Hazell served as the guest speaker, implementing a theme of helping others and working your hardest at anything you love. "Darrell did such a great job today," Loose said. "We have all been touched by cancer in some way and he is no different. I thought he gave an outstanding message to the campers and helped us all learn about more than just football." Hazell and additional members of the camp staff were also able to visit with oncology patients from Nationwide Children's Hospital during the lunch hour. Near the conclusion of the day, Doup couldn't begin to wrap his head around the attributes of John Loose and the LFG foundation as a whole. "You can't even begin to describe what the Loose family does," Doup said. "Lauren is such a special girl, her sister pitches in so much and the parents are unbelievable with the way they keep going every day. I hope we continue working with this great family for years and years." Follow the latest foundation news on Twitter and Facebook.